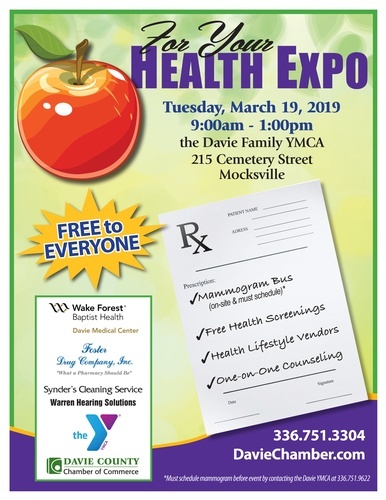 You're invited to attend the Davie County Chamber of Commerce For Your Health Expo on Tuesday, March 19, 2019 at the Davie Family YMCA. Come join us for FREE health screenings, healthy lifestyle vendors, one-on-one counseling, free tastings, MUCH MORE! Also, a special perk this year: Novant Health will be bringing their Mammogram Bus and offering FREE screenings throughout the event! Always wanted to join the Davie Family YMCA? Attend the Health Expo and they will waive your joining fee! Event Sponsors: Wake Forest Baptist Health Davie Medical Center, Davie Family YMCA, Warren Hearing Solutions & Snyder's Cleaning Service.